Apple’s worldwide developer conference kicked off in sunny San Jose, CA yesterday with Tim Cook sharing a few highlights and developer love with 6,000 attendees before unveiling new software features and updates. Augmented reality, features to monitor and improve user’s digital consumption habits and Siri Shortcuts were a few of the big takeaways of the day, but there were plenty of other great additions to Apple’s software suite. In this blog post, we’ll recap some highlights as well as features we’re most excited to see and what they mean for digital marketers. Stick with us to the end and you’ll learn of something experienced by attendees but not discussed in the keynote — and it may unlock many new possibilities across a variety of industry verticals. With the App Store’s 10th anniversary next month, Cook shared that there are more than 20 million Apple developers around the world — spanning 77 countries — and that they will have collectively earned $100 billion from the App Store as of this week. It’s clear apps play a huge role in consumers’ lives with the App Store seeing more than 500 million unique visitors every week. Additionally, the App Store for Mac is getting a fresh design with Mojave. Many iOS apps like Stocks, Apple News, Voice Memos and Home will make their way to the App Store for Mac, with Apple noting iOS developers can do the same (with minimal code changes required) in 2019 with UIKit. Augmented reality (AR) continues to become more sophisticated and accessible to a broader range of partners, promising to bring new experiences to our everyday lives. Apple has partnered with Pixar to create usdz (Universal Scene Description): a compact and open single file format optimized for sharing 3D graphics and animations across systems like Safari, Mail and iMessages — all while allowing digital objects to be placed into the real world. 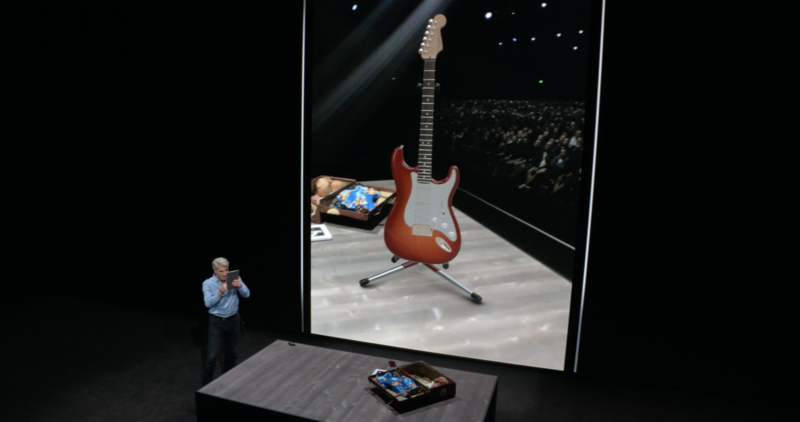 For example, Craig Federighi, senior vice president of Software Engineering at Apple, used the usdz format on the Fender website to choose a guitar and place it on a physical table via AR to see what it looks like in the real world. Adobe Creative Cloud’s support for usdz will help speed up the development of new AR content with familiar content creator apps like Photoshop and Dimension CC. Craig Federighi, senior vice president of Software Engineering at Apple projecting a Fender guitar on to the table using AR. ARKit 2 opens up a new world of AR possibilities with face tracking, 3D object detection, persistent experiences and even shared experiences where multiple users can play together. Core to all of this is accurate measurement, and consumers will be able to use the new Measure app to determine the measurements of real-world objects. With more than 10 billion requests every month, Apple is working to enable Siri to make consumers’ lives simpler with more proactive suggestions (like calling your grandma on her birthday), while also extending Siri Shortcuts to any app. Siri Shortcuts allow Apple users to set up multi-step processes that can be triggered by telling Siri their own personalized phrase. For example, if you use Tile to locate your lost keys, you can set up a shortcut that’s launched by telling Siri “I lost my keys” which will pull up the Tile app and ping your keys. Or, you can set up something more complex, such as a “heading home” command that will share your ETA with a specified person, share the best route via Apple Maps, start your favorite podcast and control home automation for your arrival. These shortcuts can also be enabled on the HomePod as well as Watch for a streamlined, multi-device experiences. A number of the key features coming to iOS 12 aim at helping users better understand their digital consumption habits, limit distractions and evaluate how they’re spending their time. Do Not Disturb has been upgraded to make bedtime more restful by eliminating notifications from the home screen and turning dark to only reflect the time. Users can then decide when to turn this off and see what they missed overnight in the morning. Do Not Disturb has also been updated with additional options, such as setting it to expire after leaving a certain location, or ending it after a certain time period for distraction-free activities or meetings. With iOS 12, Apple is also giving users more control over their notifications. Instant tuning from the lock screen lets users set an app’s notifications so they only appear in the Notification Center and not on the lock screen, or even turn them off altogether. It will also auto suggest notifications to turn off based on apps a consumer has not used. Another addition is grouped notifications, which provide lists of messages received from a particular app. Now, users can get more information at a glance and manage multiple notifications at once. A new Screen Time feature provides a weekly activity report detailing a user’s device and app usage, including a summary of the time spent in apps and when during the day, as well as a count of notifications sent by apps. This feature puts consumers even more in control of their consumption habits. While these updates provide great insight for consumers, they hold a big implication when it comes to app marketers — notifications must be more relevant and add more value than ever, or they risk opt-outs and app deletions. App limits will also be added to help users take charge of their app usage, with Apple providing reminders when a user is close (or has hit) their self-selected limits. Similarly, Screen Time helps families achieve the right balance as kids will get activity reports, with parents receiving them too. Parents can decide “allowances,” or time allocated by app or category, and even mandate when they must unplug all together. Apple Watch continues to gain traction among consumers, growing 60% in the last year. Like iOS, watchOS 5 will be upgraded to help user stay more active and connected. Users can now challenge others to some friendly competition, complete with awards for the winner. New workouts for yoga, hiking and additional running features are also to come along, each tuned to precisely measure each particular activity. Automatic workout detection senses when a user may have begun a workout but forgotten to start it on their Watch, with retroactive credit for their activity. The same goes for detecting when it seems like you’ve finished an activity but forgotten to end your workout to keep their time and calorie count as accurate as possible. Kevin Lynch, vice president of technology at Apple, shares the types of interactive notifications on Apple Watch that can simplify a user’s life. Interactive notifications make their way to the Watch, making for a more rich user experience. Now, users can check in for their flight and share details right from their Watch, extend a Yelp reservation, or pay with Apple Pay right from inside a notification, allowing for brands to make content more actionable outside of the app. Web content will also viewable from the Watch, optimized for the smaller screen and using Reader mode when available. Want to learn more about rich, interactive notifications? Check out our FAQ and see answers to top questions as well as results using this style of push notification. Other Watch additions include Apple Podcasts app, a Walkie Talkie feature and adding student ID cards to Apple Wallet and Apple Watch (this will launch in a select number of colleges in the fall, with more rolling out in time). While it wasn’t mentioned during the keynote, WWDC attendees were able to use Apple Wallet passes with NFC and Touch ID or Face ID to quickly zoom through registration. While NFC isn’t entirely new to Apple with support for loyalty auto enrollment for example, it appears Apple is opening up NFC access for additional functionality like opening car doors or a dorm room. Future applications may offer the ability to deliver tailored content based on people’s interactions in the real world — all without an app. This would certainly help drive greater mobile wallet adoption as brands look for more ways to connect with customers.